Very strong dog: will be enough of your strength to hold the leash? In spite of rather ferocious appearance, bull terrier is very weasels, it's possible to entrust children, particularly if you will take female: it allows to kids literally to wallow with her embrace. If any other dog will brush against bull terrier, it fearless dashes in the fighting and will fight to the end - never surrenders! It is a great guardian: it will let come in uninvited guest in your house , but it's possible entrusted that it won't release him back . You can't name this dog beautiful , but it has its special charm. Staffordshere bull terrier, as its nearest relative, bull terrier, keeps under frightenning appearance strangely gentile heart. It is excellent guardian, adores family, in which it lives, it's possible to entrust even small kids. 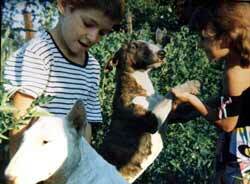 Standard hasn't specified restrictions of weight and growing: bull terrier can weight 32 kgs, and twice less. But have different sizes dog must be as powerful as possible. Bull terrier is powerful dog, with energy beating through the edge , it's impossible to doom its life in apartment, with short walks in back yard. Necessary to clean with the brush daily. If dog weighs less than 22 kgs give it one or one and a half standard ration, if weight of dog is 22-45 kgs, then one and a half or two with a half of standard ration. Bull terrier is harebrained dog, with good health. But when you buy the white dog check its rumour. White bull terriers suffer the deafness sometimes! Bull terrier derives from dogs, which persecute the oxen for fun. In 1835 English parliament has forbidden this amusement . Then group of firmed admirers of combat dogs has solved to save them, little perfect, but leave their power and unbending stability. James Hinx in Birmingham has got the new line of white dogs, having crossbreeded white english terrier with english bulldog and dalmatian. This line gave birth of breed english bull terrier. After the second world war appeared bull terriers with other colors. But popularity, which bull terrier has conquered in 40-s, as faithful friend and companion of person, noticeably decreased. In our days attractive and healthy bull terriers meet seldom. Bull terrier is gladiator amongst dogs - must be firmly shaved off, brawny, harmonious built and rolling; its exterior expresses vigilance, bright and decisiveness; it is full of fire and absolutely brave, but it's balanced and good for training. White or piebald. Dog must be "purely white", only on head are possible the small dark spots or pigmentation of skin; or dog is piebald, then preferred tiger color with white piebalds. Big, but not rough, lengthened-ovate form, with strong musculature, smoothing all jaggies to the end of the muzzle. Lobe of the nose is black and mildly directed downwards. Nostrils are well developed. Mandible is powerful. Short, low planted, holds horizontally. Thick in basis, it narrows up to the end . Round and compact; toes are together.